If and/or when is it ever okay for the Government to lie to the people? Or is it just the entropy theory that things left unattended will result in chaos? The Assassin Code is a fiction novel that answers those unnerving questions. It tells a story about people of power and the extremes they will go to protect their ideals. 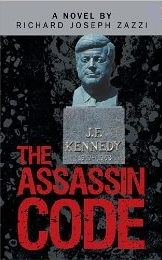 The John Fitzgerald Kennedy assassination is the most publicly witnessed murder in the history of he United States. This is an example of how it could have happened. Enjoyed the idea of the traditional American family vs. traditional Italian family. Thought the ending was interesting, hopefully a sequel is coming? Next book and new interests. www.zazzi.com. Simple theme. Powered by Blogger.